​​Pastor Bryan Wolfmueller is a pastor of Hope Lutheran Church in Aurora, CO. He is the author of Has American Christianity Failed? (CPH, 2016) and Final Victory: Contemplating the Death and Funeral of a Christian (CPH, 2010). He is the co-host of Table Talk Radio podcast and has a number of other theological projects that all end up on his blog, www.wolfmueller.co. Rev. Jonathan Fisk is Senior Pastor of St. Paul’s Lutheran Church and School in Rockford, Illinois. He is known for his work on YouTube and in radio media, as well as for his first book, Broken: 7 “Christian” Rules That Every Christian Ought to Break as Often as Possible, as well as his forthcoming book, Echo: Unbroken Truth Worth Repeating. Again. Beyond the Voting Booth: How Does a Christian Approach Politics? ​Village Lecture event from Saturday, April 30th. 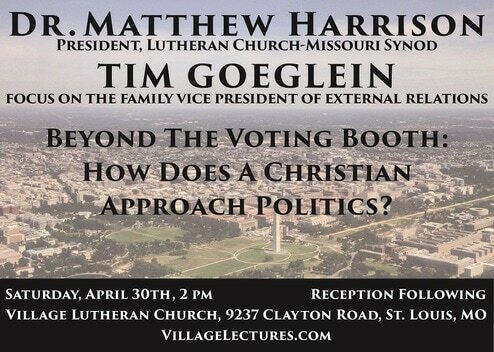 Tim Goeglein and Dr. Matthew Harrison speak on the role of the Christian in government. ​Tim Goeglein is vice president for external relations at Focus on the Family and a senior fellow at The Heritage Foundation in Washington, DC. He served as special assistant to President George W. Bush and was the President’s principal outreach contact for faith-based groups. Goeglein is the author of The Man in the Middle: Faith and Politics in the George W. Bush Era. He and his family are members of Immanuel Lutheran Church in Alexandria, Virginia. Craig Parton was at Village on October 3. Craig Parton is a Christian apologist and trial lawyer in Santa Barbara, California. He is also the United States director of the International Academy of Apologetics, Evangelism and Human Rights in Strasbourg, France. The author of The Defense Never Rests: A Lawyer Among the Theologians, Richard Whately: A Man for All Seasons, and Religion on Trial, Parton has been published in numerous law reviews and theological journals and is a regular guest on the radio program Issues, Etc. Village Lutheran Church in Ladue hosted a lecture "The Dirt on Christianity: Archaeology and the Bible" featuring renowned author and historian Dr. Paul L. Maier on Saturday, May 16th. Dr. Maier is The Russell H. Seibert Professor of Ancient History emeritus at Western Michigan University, a four-term Vice-President of the Lutheran Church–Missouri Synod, and a much-published author of both scholarly and popular works. His novels include two historical documentaries: Pontius Pilate and The Flames of Rome, as well as a theological thriller that became a # 1 national bestseller in religious fiction: A Skeleton in God's Closet. A sequel, More Than a Skeleton, appeared in 2003, and the third in the trilogy, The Constantine Codex, in 2011. His non-fiction works include In the Fullness of Time, a book that correlates sacred with secular evidence from the ancient world impinging on Jesus and early Christianity; Josephus--The Essential Works, a new translation/commentary on writings of the first-century Jewish historian; and Eusebius--The Church History, a similar book on the first Christian historian. More than five million Maier books are now in print in twenty languages, as well as nearly 300 scholarly articles and reviews in professional journals. Dr. Maier lectures widely, appears frequently in national radio, television, and newspaper interviews, and has received numerous awards. He has also penned seven children's books, and hosted six video series dealing with Jesus, St. Paul, the early church, and current Christianity. Christianity Once Turned the World Upside Down: Is It Still True? Village Lutheran Church in Ladue hosted a lecture “Christianity Once Turned ﻿the World Upside Down: Is It Still True?” featuring the renowned Christian defender of the Faith, Dr. Alvin J. Schmidt, on Saturday, February 7, 2015. Dr. Schmidt is the author of 11 books; one received an award from the American Library Association. His book How Christianity Changed the World (2004) is translated in seven foreign languages, including Russian. Another book compares Christianity to Islam; and one compares Joseph Smith (the Mormon) to Muhammad of Islam. Schmidt is a former member of Canada’s renowned Royal Canadian Mounted Police, a Lutheran clergyman and professor emeritus who has taught at Concordia University-Nebraska; Lenoir-Rhyne University; Concordia Theological Seminary, Ft. Wayne; and Illinois College. He is a “fellow” of the Society for the Scientific Study of Religion and is frequently interviewed on “Christianity and Culture” and various radio programs, including Issues, Etc. Village Lutheran Church hosted a lecture “A Lawyer’s Defense of Christianity” featuring Christian apologist and defender of the faith Dr. John Warwick Montgomery on Saturday, November 8. Over 230 people attended this event. Dr. Montgomery has authored more than 50 books in four languages and has eleven earned degrees including degrees in theology, philosophy, and law. An ordained Lutheran minister and English and French barrister, Dr. Montgomery lives in France where he is the Director of the International Academy of Apologetics, Evangelism and Human Rights. He has also served as the Distinguished Research Professor of Apologetics and Christian Thought at Patrick Henry College in Virginia and the Emeritus Professor of Law and Humanities at the University of Bedfordshire, England. Mollie Ziegler Hemingway is senior editor at The Federalist, a website about politics and culture. A longtime journalist, her work has appeared in the Wall Street Journal, the Washington Post, CNN, National Review, GetReligion, Christianity Today, Federal Times and many other publications. Mollie was a 2004 recipient of a Phillips Foundation Journalism Fellowship. She resides in Virginia.